So he got up and went back to his father. While he was still a long way off, his father caught sight of him, and was filled with compassion. He ran to his son, embraced him and kissed him. His son said to him, 'Father, I have sinned against heaven and against you; I no longer deserve to be called your son. But his father ordered his servants, 'Quickly bring the finest robe and put it on him; put a ring on his finger and sandals on his feet. Take the fattened calf and slaughter it. Then let us celebrate with a feast, because this son of mine was dead, and has come to life again; he was lost, and has been found.' Then the celebration began. First, we have the Prodigal Son. 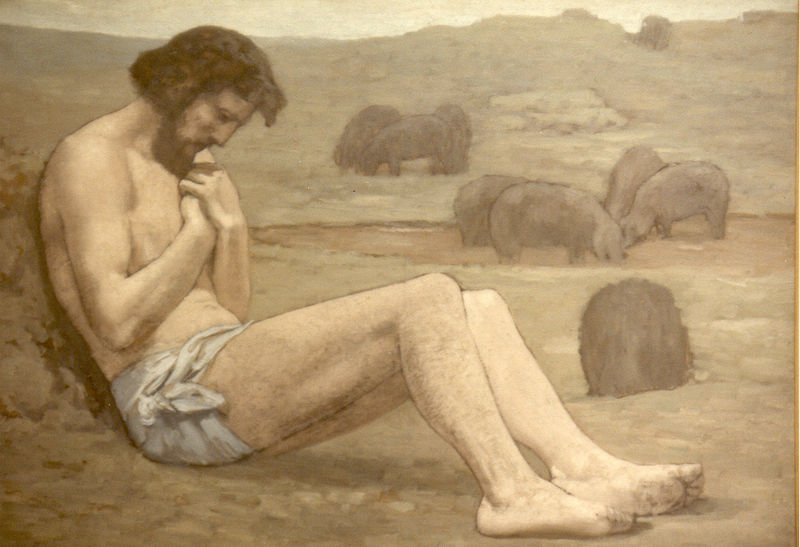 When the Prodigal Son tells the Father, "give me my share of the inheritance," he's basically telling the Father that the Father's dead to him - that the son no longer wants to be part of the Father's life; that the son's no longer interested in a relationship with the Father but only sees the Father as being useful to him because he has money. This breaks the Father's heart. Yet, the Father, respecting his son's free will allows him to take his share of the inheritance because the Father wants to be loved in freedom, not in fear or by force. This is a very accurate metaphor for how we choose sin over God. We distance ourselves away from the Father in search of greener pastures - our relationship with the Father no longer is of real value. The inheritance that the Father gives the son is a metaphor for the adoption we receive as spiritual children of God and the gifts of the Holy Spirit and the virtues that are infused into our souls at baptism. Notice that God does not take this away from us when we sin. In fact, those gifts and virtues are never more important than when we stray from the Father's house. Then the son goes off and spends his inheritance on a life of dissipation - on a life of sin. So it goes for those steeped in sin. Rather than use the virtues we receive at baptism to acquire other virtues, we can choose to waste our talents and gifts by rejecting God and selling out our dignity as children of God the Father for the fleeting pleasures of the world. Of course, we don't have to leave the Father's house or spend our gifts and talents and virtues on a life of sin. Then again, the Prodigal Son's decision to do just that is what makes the parable so compelling. The Prodigal Son then hits rock bottom. He hires himself out to work as a farm hand in a pig farm. If you know anything about the Jews, working on a pig farm was probably the most un-kosher thing you could do. The Prodigal Son has really sunk so low that he longs to eat the pods that the pigs themselves have already fed upon. The Fathers of the Church often liken the farm owner to the devil. The devil continues to fees us slop, called sin and we just eat it up and we desire it all the more. The farm owner doesn't have a speaking part in this parable and is very much like the devil - always lurking in the background but never too obvious. It is in this slavery on a pig farm that the Prodigal Son actually discovers who he is - an heir to the kingdom. It's when the Prodigal Son hits rock bottom when he comes to his senses and decides to make a move back to the Father's house - grace is at work. Similarly, when someone is having a conversion and wants to return to the Father's house through the Sacrament of Penance, there's already a special grace at work there. It's called prevenient grace, akin to prevenir, in French - it means the grace received before coming back. So, even the move to convert is already the Father reaching out to the Prodigal Son and God the Father reaching out to the sinner. It's not as if we do our best and God does the rest, as Ben Franklin's Poor Richard's Almanac would have us believe. That's Protestant theology. St. Augustine, the Doctor of Grace, would say that all good works begin in the mind of God, are carried through to completion by God and have God as their happy end. God is persistently pursuing our hearts - it's this grace that drives the Prodigal Son to come to his senses. So, the Prodigal Son heads home. He's got a plan - he'll just try to negotiate with his Father in order to be hired as a servant. Notice that the Prodigal Son doesn't want to be restored to sonship - he just wants a meal because he's hungry. However, the Father has other things in mind. The Father is looking out on the road - he is not passive at all. He could have been sitting inside his house or doing other things. Rather, we find him looking out on the road. Once he catches a glimpse of his son, he runs out after him! Isn't this in fact how God works in the Sacrament of Penance? His love is always reaching out towards us. In the parable, the Father could have justifiably sat inside his house and when he received word that his son had returned, could have said, "Well, well, well - look who's back? What does he want? I thought I was dead to him. Tell him to get cleaned up and we'll talk when I have a moment." Instead, the Father runs out to the Prodigal Son to welcome him home. He restores his sonship by putting a ring on his finger - probably a signet ring which contained the family seal and was a sign of being an heir to the estate; sandals on his feet and a robe. They even kill the fatted calf for the wayward son. Notice that the Father doesn't ask what the Prodigal Son has done with the inheritance. He doesn't say, "Well, did you spend all of it? All of it? Did you at least save some of it? Can I take that as a tax deduction?" No! No questions - just mercy. The Father's ambition for the son is to return the son to sonship. The Father's ambition for us is to make us saints. How often do we settle for so much less? How often do we think that we've got everything figured out and that our plans are better than God's plans? St. Jose Maria Escriva used to say, "If you want to make God laugh, tell him your plans." Then we encounter the older son. He's angry and jealous and resentful. The older son can't understand the logic of mercy. He only wants justice. He's also dissatisfied with having been a loyal son of the Father - as if that were not enough. The Father reasons with him, "Everything I have is yours." Is "everything" still not enough? Or do we desire other things? Are we content and joyful in being a son or daughter of the Father - is that not enough for us? Do we love God, but grudgingly? Do we live with the thought that we somehow deserve a prize for fidelity? Is eternal happiness in heaven simply not enough? The Father wants a love from us that is gratuitous, not bitter. So, part of the key to holiness is learning to live and love being a child of the Father. What a mighty project it is! Notice that neither the mercy nor the justice of the Father contradict each other. In mercy, the Father forgives the Prodigal Son. In justice, he does not give the Prodigal Son more money to burn. In God, there is no inner conflict between his justice and mercy. In the Sacrament of Penance, God forgives our sins in mercy and does not condemn us to hell, which He could in a strict and rigid code of law. So, in justice, he demands a restitution for our sins, which means time spent in purgatory if we already haven't made penance for it in this life. And I mean real penance, not just the salutary three Hail Mary's after Confession - those are just token penances. After all, could a murderer really make restitution with three Hail Mary's? The last lesson of the parable is that until the very end, there's always hope. We can always come back to the Father's house. If today you hear his voice, harden not your heart, Scripture says. Don't delay. The Father, in the Sacrament of Penance, wants to run out and restore you to Sonship - to being an heir of the kingdom. May we always have deep, filial hope in that high dignity to which we are called and may we always relish life where things are so much better - in the Father's house.